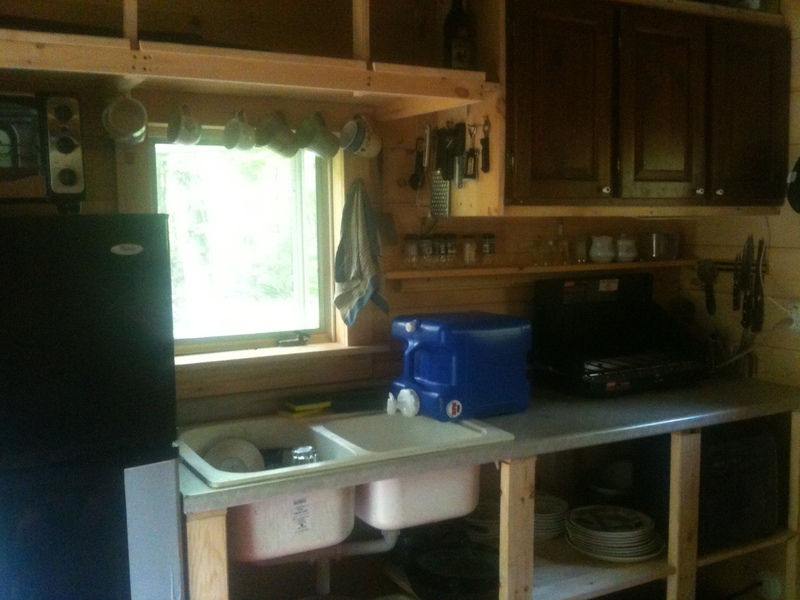 In the year Jamie has lived in her Tiny House, her water system has gone through three major phases. Phase One, thankfully, ended before I moved in and Phase Two, while effective, was quite a pain. Only about a week ago, Jamie moved into the most sophisticated Phase Three. Earning the label “most annoying part of our water system” is the need to lug water from Jamie’s parents’ house since we don’t have a well or a spring near the Tiny House. She uses her wheelbarrow to take empty jugs over, fills the jugs either with the hose or in the bathtub then wheels them back over to our house. We often keep one or two inside and the rest stay either in the wheelbarrow or on the front steps. As the winter is creeping ever closer, we’re working on a plan for where inside the house we can keep the extra just so they don’t freeze outside. When Jamie first moved into the tiny house, she placed a large 7 gallon water jug on the counter with a spigot over the sink. 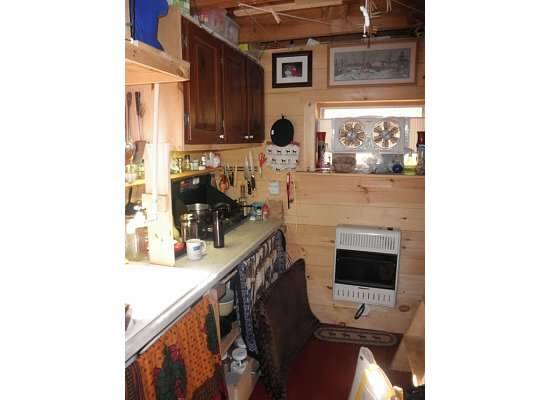 This enabled her easy access to water for cooking and cleaning, but took up a vast percentage of her ridiculously small counter space. When the jug was empty she took it over to her parents’ house and filled it then brought it back in a neverending cycle of water fillage. This worked well enough, but was never intended as anything more than a temporary solution and Jamie begain planning almost immediately for another system that would reopen the counter space. By placing the water jug on top of the high shelf over the sink and whipping up a PVC system with a spigot over one side of the sink, the water system no longer took over the kitchen counter. This had a huge benefit of opening up counter space, but in order to fill the jug Jamie had to bring it down, unscrew the pipe and spigot, fill it with water, screw the pipe back on and then heft it back up on top of the high shelf. Phase Two is also when she began using the wheelbarrow to lug multiple water jugs back and forth to her parents’ bumping the convenience level up one notch. I’m going to need Jamie’s help to explain Phase Three as it’s a much more complicated setup but I’ll leave you with these highlights: It involves a tractor battery, RV water pump, tubing, and a sink faucet. I refer to Phase Three as the Redneck Faucet.